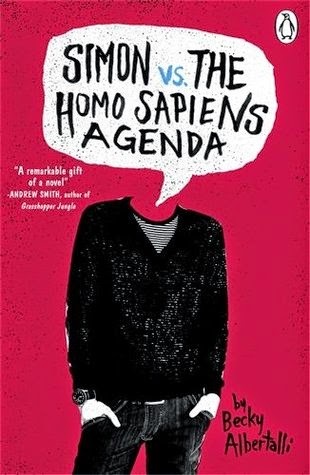 Simon vs. the Homo Sapiens Agenda by Becky Albertalli is one of my favourite books that I've read so far this year! It's funny and sweet and awkward and hugely romantic. I smiled, I laughed, I cried. There were so many points that the authors makes that made me shout 'YES, THIS' many times during the reading of this book. I loved the characters, I loved the friendships and I thought Simon and Blue were utterly adorable. This is definite new favourite of mine! At the beginning of this book our main character, Simon who is not-quite-out as gay, is blackmailed by another student at his high school. This other student has come across an exchange of emails between Simon and another boy at their school, nicknamed Blue. This other boy, Martin, implies he'll make public these emails and 'out' both Simon and Blue as being gay unless Simon helps Martin to win over the affection of one of Simon's friends. This starts a really interesting story about friendship and identity and coming out and being okay with who you are. Man, I loved this book. The book is split between Simon's narration and also these email exchanges between Simon and Blue. And it really feels like there are two main plot lines in this book. The first is Simon coming to terms not so much with his sexuality but with being okay about coming out to his friends and family. He's attracted to other boys and that's okay with him. What he's struggling with is how that will change his relationships with the people who have known him forever, like his parents and his oldest friends. There is a great line in this book about how people should have to come out as being straight and that it should be mandatory for that to be as awkward as possible. I totally agree with that sentiment! I did really love this story arc of Simon's. He has a really interesting friendship circle and family and I love the complicated dynamics that are at play in both areas of his life. And the other major story line is this flirtatious relationship that develops between Simon and Blue and how they become more and more comfortable with each other and start having feelings for the other based on what they've said in their emails. I thought the two of them were unbearably cute and I loved the almost mystery element towards the second half of this book in which Simon puts his detective hat on and tries to discover the identity of Blue. I think at the same time we see Blue being more open to the people around him and there's almost a thing between him and another character. But it was really this online love story that really appealed to me here. And oh I just wanted to give Simon and Blue big hugs for being awesome. I loved this story so much. It's so emotional and heart-felt. I loved the characters and friendships and the incredibly sweet love story between two amazing characters! I can't recommend this book enough! Oh, Maia, I absolutely LOVED it. One of my favourite books all year. Well this one sounds fun! SO SO GOOD. Highly recommended, Darren!